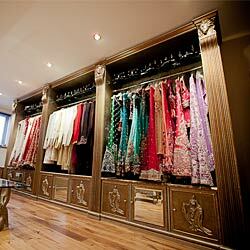 After making an appointment, the initial one to one consultation takes place in Charmi’s boutique. During this first meeting, we go through the whole collection and suggest various options available to the bride and groom. At this stage, clients get an opportunity to try on various outfits and see the styles that complement them the most. At this stage, clients also go through Charmi’s extensive colour, fabric and embroidery samples, which they are able to mix and match to create their dream outfits. The next stage soon follows with a second appointment, ‘The Design Process’. Clients have a meeting with Charmi where they are encouraged, to bring any ideas, including magazine cuttings, specific colours, a particular style or a theme. Charmi will suggest different options on fabrics and embroidery to mix and match to create their dream outfits. She will then sketch the ideas and style on paper and write detailed information on the design sheet which is mutualy agreed. Once the client is happy and places an order; an embroidery sample is produced and shown to the client for approval. 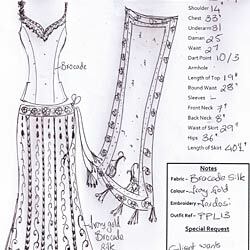 The purpose of the sample is to enable the bride to picture what the wedding outfit will look like. 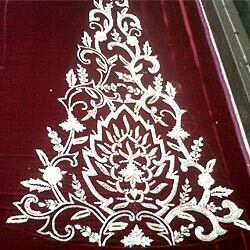 Usually choices of two embroidery samples are given to the client. At this stage it is still possible to make changes to colour, fabric and embroidery. 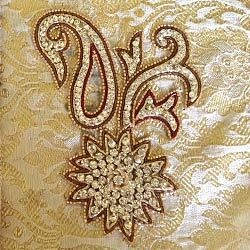 The embroidery sample is for the bride to keep, allowing her to coordinate other aspects of her special day. Once all the details are finalised, the order is put into production. The clients, upon request, then get a copy of the sketch and can also request work in progress images of their dream wedding outfit. Once all the hand embroidery is done, the outfit goes into stitching where the dress is finished with a lot of care and attention to detail. Upon completion, the clients then get a full image of their outfit before they come for their fitting. Once the outfit is ready, clients return for a final fitting. If there are any minor alterations, these are carried out within a few days. Once the bride is completely happy, the outfit is steam ironed and carefully packed, ready to wear on the big day.